Manila, Philippines - Senate President Franklin M. Drilon on Tuesday announced that both houses of Congress have agreed to increase the tax exemption limit imposed by an outdated law regarding the 13th Month Pay, Christmas bonus and other work benefits. The Senate leader said that Senate Bill No. 256, authored by Senate Pro-Tempore Ralph Recto, is one of the most prominent pro-consumer legislation which will receive urgent legislative attention "due to its direct effect to millions of Filipino workers around the country." He said the Senate intends to raise the exclusion limit on an individual's 13th month pay, Christmas bonus, and other work benefits from income taxation from the current imposed limit of P30, 000 to P75,000. 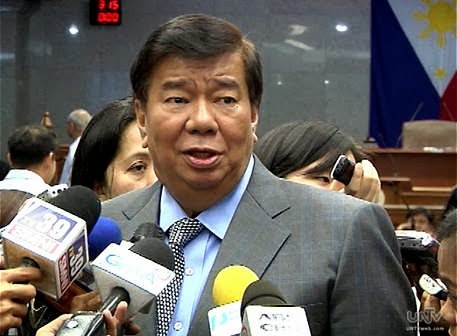 According to Drilon, both chambers are aware of the need to revisit the antiquated provisions of the law "to provide relief to state and private workers whose purchasing power has been shrinking for years due to inflation, but still have had to deal with the consequences of an outdated law." "The law was passed 20 years ago, and obviously, things have greatly changed - making such figures no longer reflective of current economic realities, thus making it even more difficult for the average Filipino worker to make both ends meet for him and his family," Drilon stressed. He was referring to Republic Act No. 7833, or the statute that imposed the P30,000 cap on bonuses back in 1994 when the lowest monthly basic salary for government employees (Salary Grade 1, Step 1) was tagged at P2,800, while the President of the Philippines (Salary Grade 33) received P25,000 per month. Today, the basic salary for government employees is now pegged at P9,000, with the highest salary reaching P 120,000 per month. "While most of the priority bills right now focus on macroeconomic progress, we have to make sure that necessary bills such as SBN 256 will also receive the required resources and attention towards their passage, for the sake of our countrymen," he said. "Our country's laws must always prioritize the improvement of the living standards of its citizenry. Bills like this are necessary to address the real-time concerns and immediate demands of our people," he added. The Senate chief has also said that there are still other measures in the legislative shortlist which aim to improve government policies rallying for the welfare of the common Filipino.